When you were five-years-old I bet ‘pirate’ was on the top of your list for what you wanted to be when you grew up. As you grew up chances are you realized that it probably wasn’t a great career choice given the high risk and whole ‘illegal’ aspect. But even if you can’t be a real pirate, the idea of it is still quite enchanting. Sailing on the high seas for weeks at a time, getting to see foreign lands, and meeting tons of new (albeit hostile) people. It’s the thing dreams are made of for some of us. 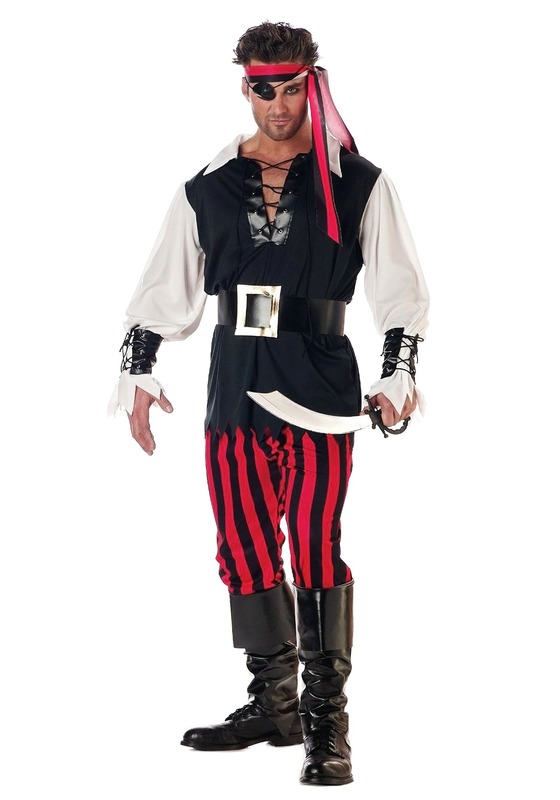 This great Adult Cutthroat Pirate Costume will make you a welcome member of any pirate crew! This pirate costume comes with everything you need to make your friends walk the plank this Halloween! The top is styled to look like a black tunic over a white shirt – but it’s all in one piece so less fuss! The shirt body is black with a faux leather placket and cord lacing. The cinch sleeves have black faux leather wrist cuffs with matching cord lacing. The matching bandana and red and black striped pants have an elastic waistband for a comfortable fit and they end just below the knees for a classic pirate look. The faux leather belt and boot covers complete the look. Practice your pirate swagger and add toy weapons such as a sword or replica flintlock pistol to complete your outfit. Check out our women's and kids' pirate costumes, for a family theme!